The Humidity Solutions Vesuvius was purposely designed to provide the ideal Hot Yoga environment. 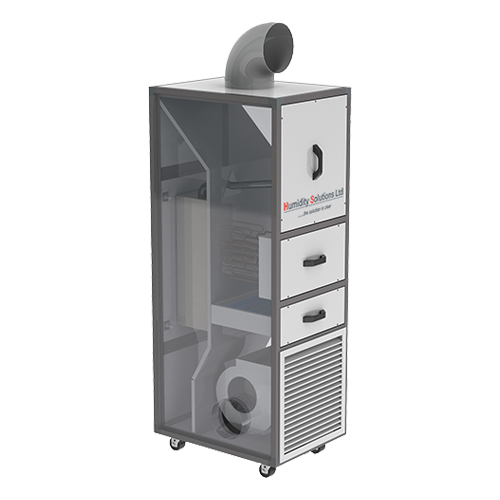 Constant air flow ensures low acoustic impact in the studio with silent heater operation and pure steam humidity added to create a comfortable environment. Conditioned air is added via ductwork to suit the studio look – funky fabric or sterile stainless steel. Fresh air can be introduced via the Vesusius system to conform with building regulations with the option of a heat recovery unit to ensure high energy efficiency. Filtration eliminates odours with an essence pump adding your desired fragrance to the supply air. Built in controls ensure that all the components needed to provide the perfect studio atmosphere work seamlessly together with programmable timer and auto start/stop shown on a straight forward operator interface control panel.